As the sun sets over the Potomac River, let the pillaging and looting begin. 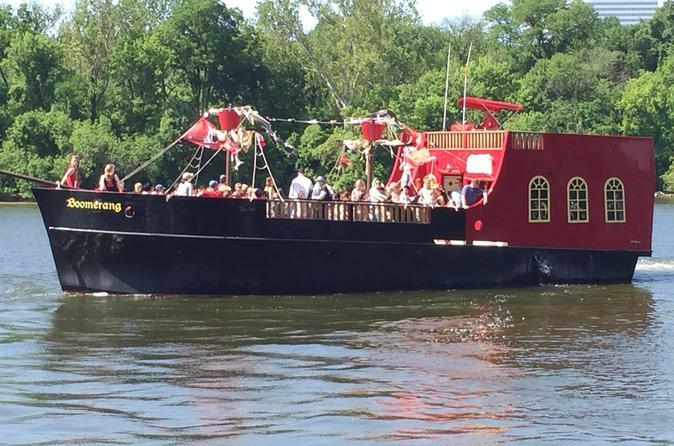 The adult party pirate cruise is anything but an ordinary night on the town. Soak up the Washington DC sky line on either of the open-air decks and then dance your cruise away. Ye land lubbers will be sporting sea legs in no time. Once you’ve soaked in Washington, DC’s famous cityscape from either of our open air decks, walk the plank over to the dance floor and find out who surrenders the booty! When you’ve worked up a thirst, head into the gally and plunder some grog with the wenches. Return for more dancing, or escape to the top deck to catch up with friends while cruising under the moonlight. We encourage you to swagger between starboard and portside and enjoy the cruise, but remember me mateys, dead men tell no tales, so be on the lookout. Arrgghh!